FILE- Russian-backed separatists sit atop a tank at a checkpoint north of Luhansk, eastern Ukraine, Jan. 14, 2015. Ukraine said Tuesday that Russian forces had attacked its military units fighting separatists in eastern Ukraine's Luhansk region. Ukrainian military spokesman Andriy Lysenko said that "in violation of all prior agreements," a "regular military formation of the Russian armed forces" had attacked Ukrainian forces in the northern part of the zone of the "anti-terrorist operation," as Kyiv calls its campaign against the pro-Russian separatists. 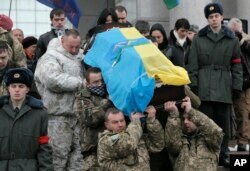 Ukrainian soldiers carry a coffin bearing the body of a fellow serviceman who was killed in fighting with pro-Russia rebels in eastern Ukraine, during his funeral in Kyiv Jan. 20, 2015. Lysenko said heavy fighting was continuing around two Ukrainian military checkpoints near Slovyanoserbsk, but that government forces had "stopped the advance of Russian troops." He also said that Ukrainian intelligence had tracked three more battalion tactical groups of Russian motorized infantry and a Russian artillery division heading toward Russia's border with Ukraine. On Monday, Lysenko said some 700 Russian troops had crossed into Ukraine that day to back up rebel forces. On Tuesday, a Russian Defense Ministry spokesman, Major General Igor Konashenkov, called Lysenko's claim "absolute nonsense." FILE - France's Foreign Minister Laurent Fabius (L), Ukraine's Foreign Minister Pavlo Klimkin (R), Germany's Foreign Minister Frank-Walter Steinmeier (2nd R) and Russia's Foreign Minister Sergei Lavrov attend a news conference in Berlin July 2, 2014. A new round of peace talks to settle the Ukraine conflict will be held Wednesday in Berlin, German Foreign Minister Frank-Walter Steinmeier said. 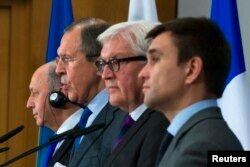 The foreign ministers of Ukraine, Russia, France and Germany will participate. “We're faced with a threatening situation again due to new fighting flaring up in eastern Ukraine in recent days,” Steinmeier said Tuesday. According to Steinmeier, the request for a meeting came from Russian Foreign Minister Sergei Lavrov and Ukrainian Foreign Minister Pavlo Klimkin. “We now need to prevent military confrontations from intensifying any more and avoid further political escalation between Kyiv and Moscow,” Steinmeier said. A meeting on Ukraine involving the four countries’ leaders was to take place last week in Kazakhstan but was called off because of lack of progress in the implementation of a 12-point peace plan the warring sides agreed to in September in Minsk, Belarus. Meanwhile, Ukraine's Klimkin accused pro-Russian separatists in Ukraine’s east of using the Minsk cease-fire deal to seize an additional 500 square kilometers (194 square miles) of land. "Taking advantage of the fact that our forces complied with the cease-fire, the terrorists seized very substantial territory," he said at a news conference. At the request of the office of Ukraine’s prosecutor general, a Kyiv court issued an ‘in absentia’ arrest warrant for former President Viktor Yanukovych. The move is a procedural requirement needed for requesting Yanukovych's extradition from Russia, the prosecutor general’s office said Tuesday. Yanukovych fled Ukraine for Russia last February in the face of mass street protests against his government. More than 100 people, mostly demonstrators, were killed during the rallies. Protest leaders allege that Yanukovych gave the order to security forces to use lethal force against demonstrators. He is also accused of abuse of power and corruption. Earlier this month, Interpol put Yanukovych and other former Ukrainian officials on its international “wanted persons” list. Interpol’s charges against the former president include misappropriation and embezzlement. Last week, Russia's Interfax news agency quoted what it called "a source familiar with the situation" as saying that Moscow is likely to turn down a request to extradite Yanukovych, who is believed to be living in an upscale suburb of the Russian capital. Yanukovych’s ouster, which was precipitated by his abandoning an association agreement with the European Union in favor of closer ties with Moscow, is widely believed to have prompted Russia’s annexation of Ukraine’s Crimea followed by a separatist conflict in the country’s east which to date has claimed more than 4,800 lives. Both are seen as part of efforts by Russia to destabilize Ukraine, now under a new pro-Western leadership. A Ukrainian Central Bank official has voiced optimism on the prospects of securing aid from the International Monetary Fund to cover a $15 billion funding gap, as negotiations by both sides on a new tranche of credit continue in Kyiv. Ukraine, whose economy has been pushed close to bankruptcy by the ongoing conflict in its east, depends on outside assistance as it faces a budget shorfall and huge debt repayments. “The talks are constructive. Cooperation with the IMF is fruitful. I feel optimism about the possible outcome,'' the first deputy head of Ukraine's Central Bank, Oleksander Pisaruk, told journalists Tuesday. An IMF team has been in Kyiv since January 8 negotiating the disbursement of a third tranche from the Fund’s current $17 billion assistance package for Ukraine. Kyiv has already received two tranches worth $4.6 billion. Negotiations on the third tranche are expected to last until the end of the month. Disbursement hinges in large part on Ukraine’s commitment to implement long-promised reforms.